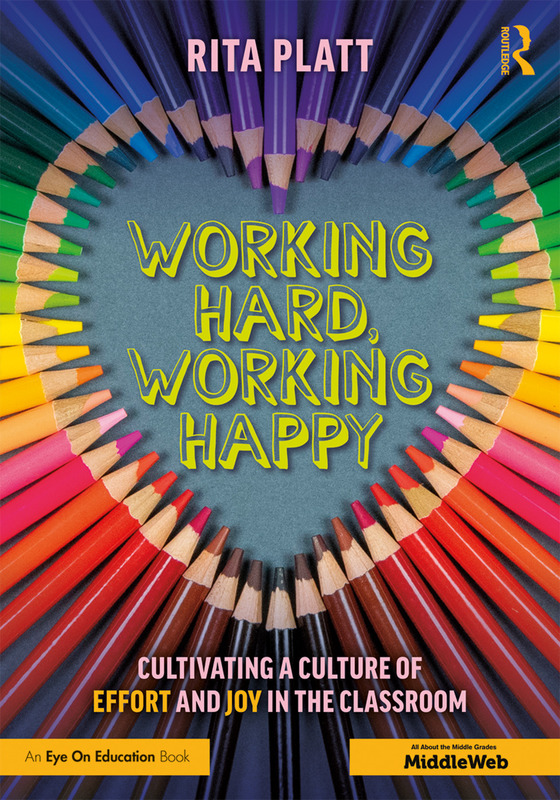 In this new book from Routledge and MiddleWeb, author Rita Platt shows how you can create a joyful classroom community in which students are determined to work hard, be resilient, and never give up. She describes how to help build students’ purpose, mastery, and autonomy, so they take ownership over their work and develop a growth mindset for success. Each chapter includes practical tools, tips, and ideas that you can use immediately to develop these skills in students, so they find more joy and success in the learning process. "This is a book every educator - whether veteran, aspiring, or somewhere in between - should read. In fact, if you could only read one book in your whole teaching career, I would recommend this one. With her engaging style and vast expertise, Rita Platt invites readers to embrace both joy and earnest learning in a classroom where every student (and teacher!) will thrive. In an era where the value of joy is often overlooked and learning targets often go unmet, Platt shows us we don’t have to choose between the pursuit of joy and the pursuit of achievement. Rather, she shows us practical, clever ways to make a happy and accomplished classroom a reality. Platt offers numerous, varied (and brilliant!) ideas so readers can choose what works best for them. One of my favorite writers in the field, Platt brings strategies to life with clear direction that is grounded in research, paired with helpful exercises, supported with resources, and illustrated with real-world examples. She shares stories from all kinds of classrooms and situations, showing us how happiness can thrive along any teacher’s personal style. Plus, she does this while helping readers maximize important factors like relations with parents, classroom management, differentiation, and more so that all good practices work seamlessly together (instead of separate endeavors that stack up and overwhelm busy teachers). In fact, she even helps us take excess work off our plates (like by dropping certain assignments and purging old clutter). 8. Effort and Joy, They’re Not Just for Students! Rita Platt (@ritaplatt) is a National Board Certified, award-winning teacher. She is a self-proclaimed #edudork with master’s degrees in reading, library, and leadership. Her experience includes teaching learners from preschool through adult in remote Alaskan villages, inner cities, and rural communities. She currently is a school principal, teaches graduate courses for the Professional Development Institute and writes for MiddleWeb.